As the compound minds created by the Flood expand and grow, a Gravemind can consciously exert control over a wider area or divide its attention among many more intricate plots. "Entire planetary ecosystems have apparently undergone conversion to what are being referred to as Key Minds." — String 18, one of thirty-nine such abstracted pieces of sourced from a Catalog unit and damaged monitor associated with a single fossilized Juridical. Key minds are specialized Flood coordinating bodies created through the fusing of captured sentient entities with pure Flood cells. Key minds act as coordinators for nearby Flood forms, leveraging wisdom harvested from the parasites' hosts to expand, outwit, overwhelm, and consume other life. There are various types of key minds, from the relatively simple Proto-Gravemind agglomerations, to the apex Gravemind forms through which the parasite’s true intelligence can manifest. Specialized key minds are also assembled if the Flood is allowed to spread out of control, including mobile command forms and specialized meta-networks that harness the neurosystems of entire planetary population for the purpose of controlling Flood activities at an interstellar scale. The abomination, an evolved form of the juggernaut command form, is a type of key mind war-form. The creation of key minds causes an infestation to transition from feral aggression to coordinated conversion. As the Flood grow in number, key minds combine and expand into larger, exponentially more intelligent networks. The appearance of these vile collectives typically indicates most local sentient hosts have been infected or consumed. Once a critical mass of key minds have been combined, the Flood's centralized intelligence can begin to emerge in their seething mass of corrupted flesh: a Proto-Gravemind that sifts through and feeds on the memories of every Flood-infected victim. Near the end of the Forerunners' struggle against the Flood, entire planetary ecosystems underwent conversion to the Flood. The monicker "Key Mind" was first used by Forerunners to refer to the Flood controlling these ecosystems. These Key Minds displayed extraordinary strategic planning abilities and appeared to be more than a match for even any metarch-class ancilla. They were capable of seizing complete control of besieged sectors and sending converted battle fleets through unprecedented numbers of slipspace portals through the use of Precursor neural physics. Many thousands of years after the war, in 2531, a Proto-Gravemind was encountered by the UNSC Spirit of Fire on the Forerunner shield world Etran Harborage where it attempted to trick the human crew. The crew managed to kill the Proto-Gravemind and later destroyed the planet itself. 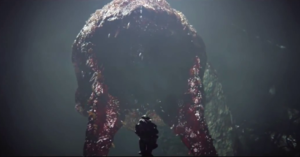 Similarly, in 2552, a Proto-Gravemind was encountered by Spartan II John-117 during the Battle of Installation 04 on board the Truth and Reconciliation where it was attempting to use the knowledge of the assimilated Captain Jacob Keyes to fly the ship to Earth. It was destroyed by Covenant special ops teams before the ship was captured by human forces. Another Proto-Gravemind formed aboard the Infinite Succor during the same battle, but was destroyed by Covenant forces led by Rtas 'Vadum along with the ship. Later that year, a Gravemind that had established itself on Installation 05 boarded the Covenant capital, High Charity, and overtook it. It used the mobile station to pursue United Nations Space Command and Covenant forces to Installation 00, where it was dealt a devastating blow by the firing of the incomplete Installation 08 which destroyed the Gravemind and ended the Flood outbreak on the installation. In the years to follow, humans studying records from the Forerunner-Flood War realized that the complexity witnessed to give rise to the Key Minds wasn't exclusive to a new stage, but rather was pervasive at every stage of progression, especially leading to the formation of Proto-Graveminds. In 2559, key minds were encountered again on Installation 00 in the form of abominations and a Proto-Gravemind when the Banished forces occupying the installation accidentally released what remained of the Flood from High Charity's crash site where it had previously been confined. The Proto-Gravemind was destroyed by Banished forces before it could become a Gravemind and the installation's Sentinels were able to once more contain the Flood.